For other uses, see Crown of Thorns (disambiguation). For the first four centuries there was no extra-biblical mention of the crown of thorns. A few writers of the fifth and sixth centuries AD speak of a relic known to be still in existence and venerated by the faithful. St. Paulinus of Nola, writing after 409, refers to "the thorns with which Our Saviour was crowned" as relics held in honour along with the cross to which he was nailed and the pillar at which he was scourged (Epistle Macarius in Migne, Patrologia Latina, LXI, 407). Cassiodorus (c. 570), when commenting on Psalm lxxxvi, speaks of the crown of thorns among the other relics which are the glory of the earthly Jerusalem. "There", he says, "we may behold the thorny crown, which was only set upon the head of Our Redeemer in order that all the thorns of the world might be gathered together and broken" (Migne, LXX, 621). When Gregory of Tours in De gloria martyri avers that the thorns in the crown still looked green, a freshness which was miraculously renewed each day, he does not much strengthen the historical authenticity of a relic he had not seen, but the Breviary or Short Description of Jerusalem:16) (a short text dated to about 530 AD:iv), and the itinerary of Antoninus of Piacenza (6th century):18 clearly state that the crown of thorns was then shown in the "Basilica of Mount Zion," although there is uncertainty about the actual site to which the authors refer. :42 et seq.) From these fragments of evidence and others of later date (the "Pilgrimage" of the monk Bernard shows that the relic was still at Mount Zion in 870), it is likely that a purported crown of thorns was venerated at Jerusalem from the fifth century for several hundred years. Francois de Mély supposed that the whole crown was not transferred to Byzantium until about 1063. In any case Justinian (died in 565) is stated to have given a thorn to St. Germain, Bishop of Paris, which was long preserved at Saint-Germain-des-Prés, while the Empress Irene, in 798 or 802, sent Charlemagne several thorns which were deposited by him at Aachen. Eight of these are said to have been there at the consecration of the basilica of Aachen by Pope Leo III. The presence of the Pope at the consecration is a later legend, but the relics apparently were there, for the subsequent history of several of them can be traced without difficulty. Four were given to Saint-Corneille of Compiègne in 877 by Charles the Bald. Hugh the Great, Duke of the Franks, sent one to the Anglo-Saxon King Athelstan in 927, on the occasion of certain marriage negotiations, and it eventually found its way to Malmesbury Abbey. Another was presented to a Spanish princess about 1160 and again another was taken to Andechs Abbey in Germany in the year 1200. 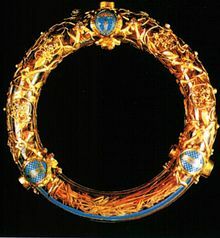 Relic of the crown of thorns, bought by Louis IX from Baldwin II. It was preserved at the Notre-Dame de Paris until April 15, 2019, when it was rescued from a fire at the cathedral. 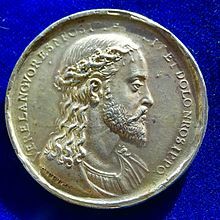 In 1238, Baldwin II, the Latin Emperor of Constantinople, anxious to obtain support for his tottering empire, offered the crown of thorns to Louis IX, King of France. It was then in the hands of the Venetians as security for a heavy loan (13,134 gold pieces), but it was redeemed and conveyed to Paris where Louis IX built the Sainte-Chapelle (completed 1248) to receive it. The relic stayed there until the French Revolution, when, after finding a home for a while in the Bibliothèque Nationale, the Concordat of 1801 restored it to the Church, and it was deposited in the Cathedral of Notre-Dame. The relic that the Church received is a twisted circlet of rushes of Juncus balticus, a plant native to maritime areas of northern Britain, the Baltic and Scandinavia; the thorns preserved in various other reliquaries are of Ziziphus spina-christi, a plant native to Africa, Southern and Western Asia, and had allegedly been removed from the crown and kept in separate reliquaries since soon after they arrived in France. New reliquaries were provided for the relic, one commissioned by Napoleon, another, in jewelled rock crystal and more suitably Gothic, was made to the designs of Eugene Viollet-le-Duc. In 2001, when the surviving treasures from the Sainte-Chapelle were exhibited at the Louvre, the chaplet was solemnly presented every Friday at Notre-Dame. Pope John Paul II translated it personally to the Sainte-Chapelle during World Youth Day. The relic can be seen only on the first Friday of every month, when it is brought out for a special veneration mass, as well as each Friday during Lent. See also Feast of the Crown of Thorns. The relic was saved by members of the Paris Fire Brigade, during the Notre-Dame de Paris fire of April 15, 2019. Authorities are agreed that a sort of helmet of thorns must have been plaited by the Roman soldiers, this band of rushes being employed to hold the thorns together. It seems likely according to M. De Mély, that already at the time when the circlet was brought to Paris the sixty or seventy thorns, which seem to have been afterwards distributed by St. Louis and his successors, had been separated from the band of rushes and were kept in a different reliquary. None of these now remain at Paris. Some small fragments of rush are also preserved ... at Arras and at Lyons. With regard to the origin and character of the thorns, both tradition and existing remains suggest that they must have come from the bush botanically known as Ziziphus spina-christi, more popularly, the jujube tree. This reaches the height of fifteen or twenty feet and is found growing in abundance by the wayside around Jerusalem. The crooked branches of this shrub are armed with thorns growing in pairs, a straight spine and a curved one commonly occurring together at each point. The relic preserved in the Capella della Spina at Pisa, as well as that at Trier, which though their early history is doubtful and obscure, are among the largest in size, afford a good illustration of this peculiarity. Not all of the reputed holy thorns are first-class relics, that is, relics of the original crown. M. de Mély was able to enumerate more than 700. The statement in one medieval obituary that Peter de Averio gave to the cathedral of Angers, "unam de spinis quae fuit apposita coronae spinae nostri Redemptoris" ("one of the spines which were attached to the thorny crown of our Redeemer") (de Mély, p. 362) indicates that many of the thorns were relics of the third class—objects touched to a relic of the first class, in this case some part of the crown itself. (In Roman Catholic tradition, a relic of the first class is a part of the body of a saint or, in this case, any of the objects used in the Crucifixion that carried the blood of Christ; a relic of the second class is anything known to have been touched or used by a saint; a relic of the third class is a devotional object touched to a first-class relic and, usually, formally blessed as a sacramental.) Again, even in comparatively modern times, it is not always easy to trace the history of these objects of devotion, as first-class relics were often divided and any number of authentic third-class relics may exist. The Holy Thorn Reliquary in the British Museum, containing a single thorn, was made in the 1390s for the French prince Jean, duc de Berry, who is documented as receiving several thorns from Charles V and VI, his brother and nephew. The Catholic Encyclopedia (1908) reported two "holy thorns" were venerated, the one at St. Michael's church in Ghent, the other at Stonyhurst College, both professing to be the thorn given by Mary Queen of Scots to Thomas Percy, Earl of Northumberland. France: Sainte-Chapelle: A portion of the crown of thorns, brought to the site by Louis IX. Italy: Rome, Santa Croce in Gerusalemme: Two thorns from the crown of thorns. 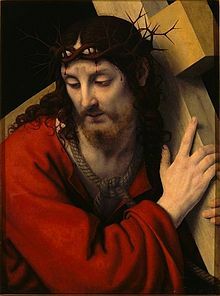 The appearance of the crown of thorns in art, notably upon the head of Christ in representations of the Crucifixion or the subject Ecce Homo, arises after the time of St. Louis and the building of the Sainte-Chapelle. The Catholic Encyclopedia reported that some archaeologists had professed to discover a figure of the crown of thorns in the circle which sometimes surrounds the chi-rho emblem on early Christian sarcophagi, but the compilers considered that it seemed to be quite as probable that this was only meant for a laurel wreath. The image of the crown of thorns is often used symbolically to contrast with earthly monarchical crowns. In the symbolism of King Charles the Martyr, the executed English King Charles I is depicted putting aside his earthly crown to take up the crown of thorns, as in William Marshall's print Eikon Basilike. This contrast appears elsewhere in art, for example in Frank Dicksee's painting The Two Crowns. Carnations symbolize the passion as they represent the crown of thorns. Reliquary made in 1806, commissioned by Napoleon, preserved at Notre-Dame Cathedral. A second reliquary from 1862, designed by Viollet-le-Duc preserved at Notre-Dame Cathedral. Detail of the 1862 reliquary. The Sainte-Chapelle, built to house the Passion Relics. In regard to the Crown of thorns, it would seem that its twigs had been planted that they might grow again. Otherwise I know not how it could have attained to such a size. First, a third part of it is at Paris, in the Holy Chapel, and then at Rome there are three thorns in Santa Croce, and some portion also in St. Eustathius. At Sienna, I know not how many thorns, at Vineennes one, at Bourges five, at Besan~on, in the church of St. John, three, and as many at Koningsberg. At the church of St. Salvator, in Spain, are several, but how many I know not; at Compostella, in the church of St. Jago, two; in Vivarais, three; also at Toulouse, Mascon, Charrox in Poicton, St. Clair, Sanflor, San Maximinin Provence, in the monastery of Selles, and also in the church of St. Martin at Noyon, each place having a single thorn. But if diligent search were made, the number might be increased fourfold. It is most evident that there must here be falsehood and imposition. How will the truth be ascertained? It ought, moreover, to be observed, that in the ancient Church it was never known what had become of that crown. Hence it is easy to conclude, that the first twig of that now shown grew many years after our Saviour's death. ^ Wall, J. Charles (2016). Relics from the Crucifixion: Where They Went and How They Got There. Sophia Institute Press. p. 95. ISBN 9781622823277. Retrieved 19 April 2019. ^ Published in Monumenta Germaniae Historica: Scriptores Merovingenses", I, 492. ^ a b The Epitome of S. Eucherius About Certain Holy Places: And the Breviary or Short Description of Jerusalem. London: Palestine Pilgrims' Text Society. 1896. ^ a b Stewart, Aubrey; Wilson, CW, eds. (1896). Of the Holy Places Visited by Antoninus Martyr (Circ. 560–570 A.D.). London: Palestine Pilgrims' Text Society. Retrieved 16 April 2019. ^ Davisson, Darrell D (2004). Kleinhenz, Christopher (ed.). Medieval Italy: An Encyclopedia. 1. Abingdon, England: Routledge. p. 955. ISBN 9780415939294. ^ "France: Kissing the original Crown of Thorns worn by Jesus | Minor Sights". www.minorsights.com. Retrieved 2016-08-05. ^ "Den virtuella floran: Juncus arcticus Willd". Naturhistoriska riksmuseet, Sweden. Retrieved 20 July 2018. ^ ""Computer glitch" may be behind Notre Dame Cathedral fire, rector says - live updates". CBS News. 19 April 2019. ^ a b Thurston, Herbert (1908). "Crown of Thorns". The Catholic Encyclopedia. New York: Appleton. ^ Vandaele, Luc (20 March 2006). "In de ban van de Heilige Doorn (Wevelgem)". Het Nieuwsblad (in Dutch). Retrieved 4 February 2014. ^ Deger, Manfred (24 August 2011). "Glaube: Der Dorn und die Bruderschaft". Augsburger Allgemeine (in German). Retrieved 4 February 2014. This article incorporates text from a publication now in the public domain: Herbermann, Charles, ed. (1913). "Crown of Thorns" . Catholic Encyclopedia. New York: Robert Appleton. Wikimedia Commons has media related to Crown of Thorns.